Pravan's sixth and Priyasha's third annual Easter egg hunt. Pass the news to all moms you know. Just one rule, no candy in the eggs please. Entry fee is 3 cans of food for the food bank or more. 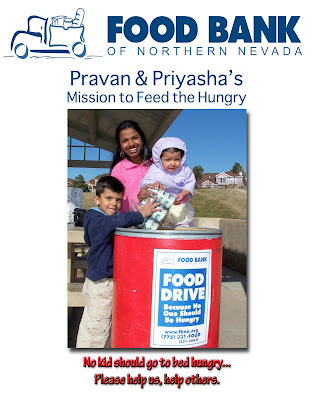 This is Pravan and Priyasha’s second year helping the food bank. Please join the kids on their mission to feed the hungry.Please forward this to everyone you know as it is an open invitation. I would like to fill more than one barrel of food for the food bank. See you there for an eggciting time! This was the info that was floating around on the e-mails and via word of mouth. This was the sixth year that I hosted it and it was Priyasha's third year as she is only three. Collecting food for the food bank started out as a threat at the dinner table with the kids. I told them that lots kids were starving and go to bed with no food.Next thing I know the harshness of the truth right around us and far away was too much for either one of my kids as they were both in tears. They wanted to share their dinner with the hungry kids and so the food bank collection for my kids and I was born. This year is year two we are supporting the food bank. It was a bigger success than last year and we are so happy that we can help. The food bank is 35 % up in their demand for food yet with the down economy they need your help more then ever. Todd and I are very proud of the kids and I will do all I can to help support their dreams. The little people are making a difference with our help and I hope you will take the time to donate some food to the food bank in your area or do something similar and bless someone in need. The big day has finally arrived. We have been promoting this while over a month now. I had passed out 250 fliers in my son's school amongst the first graders and kindergartners. There also was a large group of my friends that helped me pass out the invite. I really was expecting a large group of people today. I was actually nervous about it. It was extremely successful. Lots of people close to 100 showed up. We filled up a huge barrel of food. Each barrel can hold up to 250 pounds. The guy who picked it up estimated that we had 362 pounds of food. I will get the exact figure in the morning and update you. As you many of you know the kids and I have a goal to get 10 barrels of food by the end of the school year. We have one down and nine more to go. After spring break we will have the schools on the area involved and a few local business's that will help out as well. I am now drained and really sick. I hope to have a some what quiet week and rest up. I have scheduled rest in this week and a doctor's appointment and a dentist appointment.It is about time this body got a tune up. I sure do like being in 10Th gear but the wheels need some grease and I earned my rest. Thank you for helping me help my kids help all the other kids that need some food. Here is a poster and the invite so you can see what we have been up to. A big thank you to David Spillers from Digi Print Reno for sponsoring the posters. http://www.digiprintcorporation.com/ David was very generous to sponsor some fantastic posters that will be used in the schools to promote this mission. Thank you to Kirk Bailey who helped make today's event a success and help me get the posters sponsored. I want to say a big thank to all the people that have assisted me in making today a huge success. We could not have done it without you. Thank you for reading the great achievements of my kids. I will keep you updated on how we are doing with our goal of 10 barrels. Thanks for stopping by and reading our story. There you go again - making a difference in the world. Bless you!